Taking your child adopted from China back for a visit? Go with a group. Goofing around together at the orphanage where they lived as babies. Having taken my daughters back to China a few times now, starting when my oldest daughter was four years old, I have decided the best way to go is in a group with other adoptees and their families, and preferably on a tour with six or more kids. Here’s why: Even if traveling in an entourage is not something you are keen about—I am a sworn loner when it comes to international travel—it’s important to first honor who your child is now, and that is typically a young person finding a path to her identity. 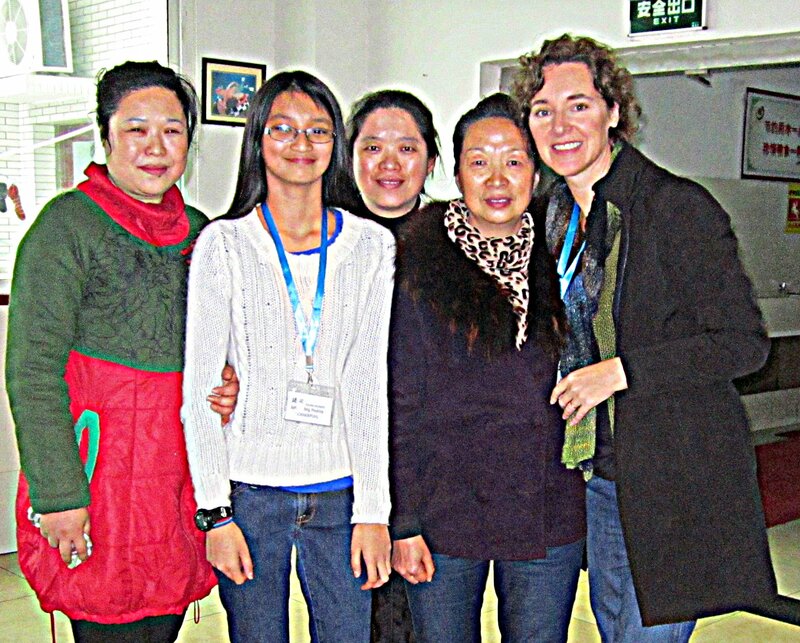 Sharing that journey to China with kids who share her story is a great way to reinforce that she is not odd or alone in negotiating two countries or growing up in a transracial family with little or no knowledge of her birth family. This time we returned when my oldest daughter was 13 years old and with 12 other girls adopted from her orphanage, ages 6 to 12. As we drove through the green Chinese countryside or the crowded cities, the girls goofed off together in the back of the bus, made up songs, and waved to startled folks in passing cars. That part was fun, although it could look like a distraction from the real purpose of the trip. The girls seemed at times determined to be unaware of China, they were so absorbed in each other. I wasn’t the only parent who tried to get her daughter to turn away from the other kids to notice the water buffalos or the height of a mountain. 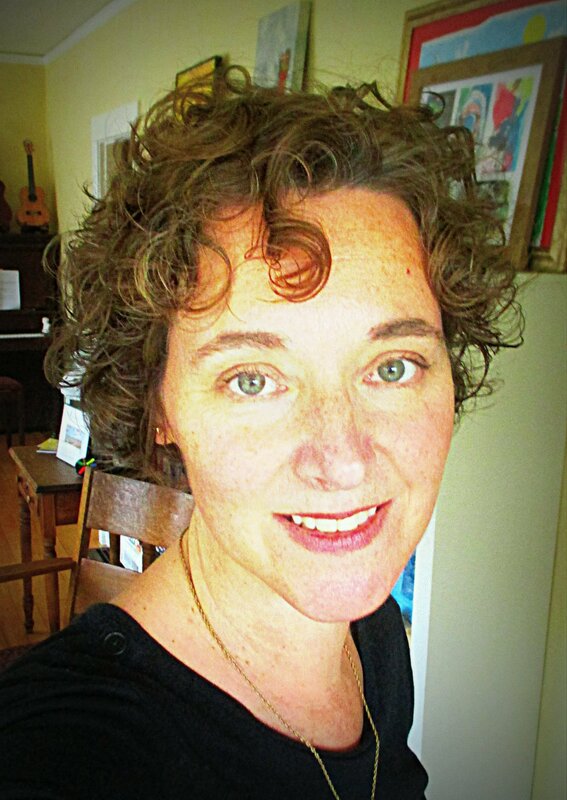 What it took time for me realize was my daughter was absorbing her birth country in the best way for her: In quick glimpses at first and from inside the safe nest made up of other girls like her. Returning to a country you left as a baby, and one you might have mixed feelings about, can be a lot to take in, and some of it hard. My daughter had to process the minimal amount of information available in her original adoption file which she was able to see on this visit, the inability of our guide to determine the exact location where local police had found her on the day she was taken to the orphanage (so much has already changed in China since then), and the awkward times when people in her Chinese hometown asked her questions she could not usually understand or answer. Walking together in a village. Sharing those moments with the other girls made them bearable, even funny. Eating Oreos in the rain together on the street where some of you were left as babies takes some of the sting out of a painful part of your story and even lets you claim and reframe it in your own way. Traveling in a group also means you are like other kids in China, who also run in packs (like kids everywhere) when they are out and about. The girls on our tour flew kites together beside the Yangtze River and were just another loud gathering at table at a McDonalds, one situated not far from the orphanage where they had lived as infants. My oldest daughter with the aunties who cared for her as a baby (on both sides of her), the orphanage director who also cared for her, and me during our visit . Since we’ve returned home to the US, my daughter told me she wants to use her Chinese middle name and is open about her adoption and race when she talks with other people. I credit this good step in part to the warm welcome she received in China, and that included the one from orphanage staff, who were prepared in advance that 13 of the children they had cared for were returning. That many girls coming together was a big deal—so big the local media filmed their arrival. Interestingly enough, the interview she had with a local reporter helped clarify something important for my daughter. In the process of answering the tv crew’s questions, she strengthened her growing sense of self as being a Zhong guo ren—a “Chinese person”– and an American. There is no perfect formula to creating a good trip back to China for your child, but for my daughter traveling that road with other kids who share her story was the best way. 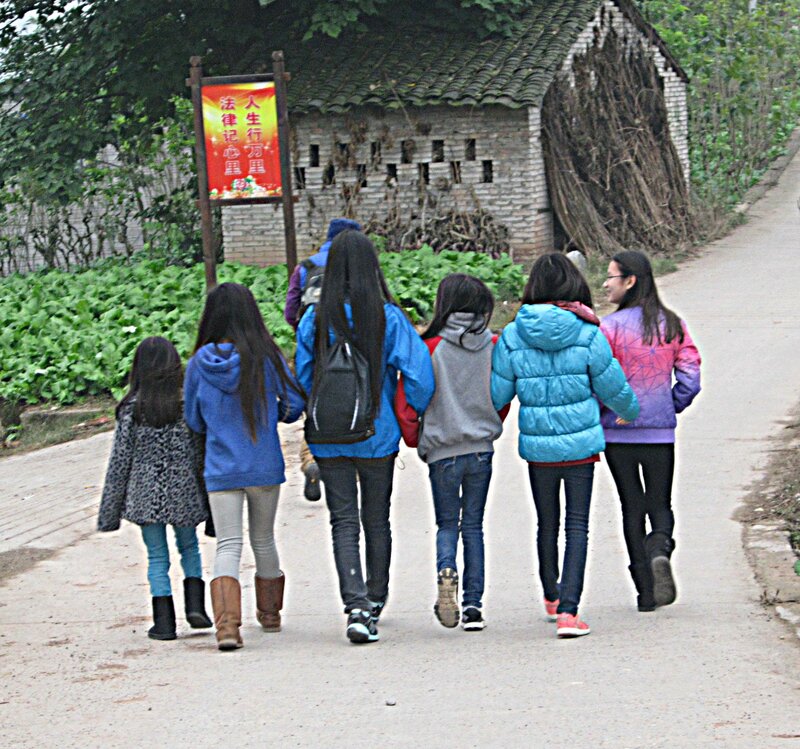 If you want to arrange for a group trip back to China, connecting with families who have adopted children from the same orphanage is a great way to start. Many have yahoo email groups. A group can also get better prices on lodging and sights in China. You can lobby for more time at the orphanage too. We asked and were able to celebrate Thanksgiving eating dumplings with the orphanage staff! There are several agencies now offering heritage or adoption tours. Whenever possible try to find one that will bring a group of adoptees from the same orphanage back together rather than children from different orphanages on a larger, more general tour. The shared visit to the place where they lived prior to adoption was meaningful and powerful for the kids in our group. 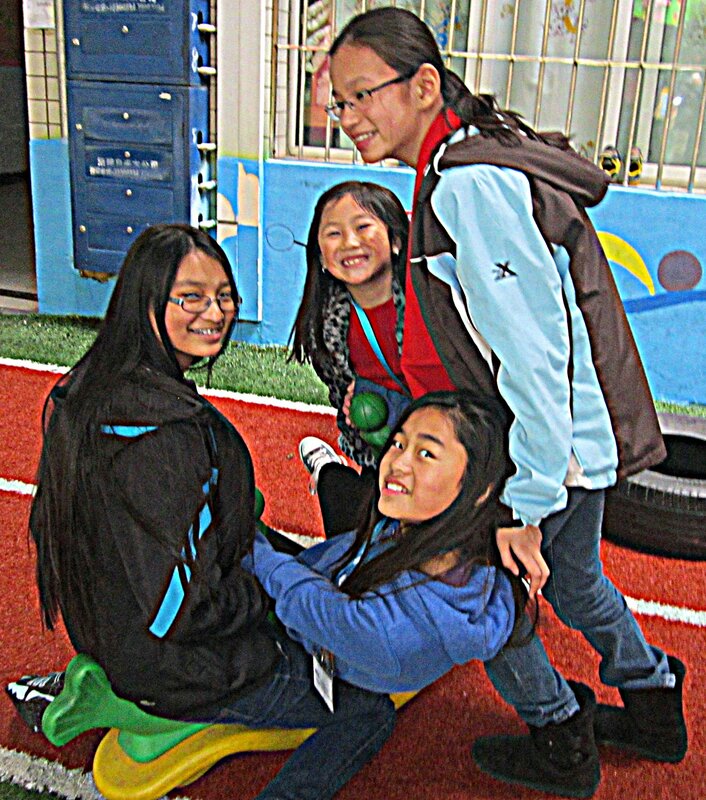 This entry was posted in Uncategorized and tagged adopted from China, China adoptee, China heritage trip. Bookmark the permalink.